This little test program has allot of user input validation. About 10 years ago while working as a pipefitter I was called upon to figure out how to fit a riser pipe onto a reducer. Since the reducer is tapered there was no normal way to do it. I had to calculate as a best guess as to what my dimensions would be based on what I already knew about fitting pipe to pipe. It didn’t turn out near as pretty as I would have hoped , but a grinder does wonders to finish getting it closer to where it needed to be. While I’m currently laid off, even though I haven’t had to do one of these since then, I finally decided to set down and figure out all of the math involved to create the 8 points and lengths needed for half of the riser circle and to be able to add the differences in the taper of the reducer.It took about 3 days working on and off to complete the formula to do all of the calculations required. Do to the massive amount of calculations required to output the final 8 lengths, I wanted to create a program that does all of the math for the user. My first hurdle is the user input validation. I need to validate if the person is inputting a decimal, a fraction or some off the wall entry. Since the normal user would input a fraction, I searched for a premade function on the internet for the fraction to decimal conversion. I found this one Here from a March 14, 2008 blog post. You find very few that go from fraction to decimal. Most samples go from decimal to fraction. Dim decimalVal As String = "0"
After getting the code to work I then started thinking about user input validation. I added validation for every type of malformed input I could think of and gave the ability to return an error or return the result of the conversion. As you can see the first screen shot is a normal Conversion. 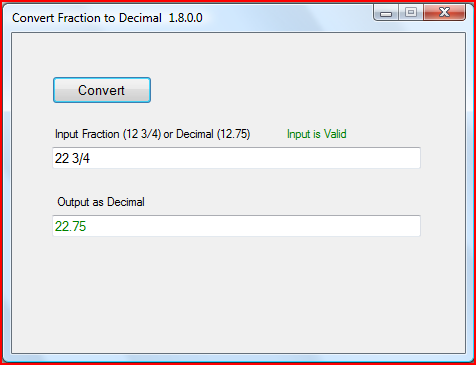 The second screen shot shows the fraction with the enumerator larger than the denominator , I could have allowed this type of input, but in this case I am catching for when people swap the two numbers. Dim regx As New Regex("^[a-zA-Z]") 'Starts at the begining and checks for any upper or lower case letters. lblInputValidation.Text = "Input is Valid"
outputStr = "Please check you are not Spelling your whole number"
lblInputValidation.Text = "Input is Not Valid"
outputStr = "Nothing was input"
lblInputValidation.Text = "Nothing was input"
'returns this if the input number is realy messed up. outputStr = "Input not reconised"
lblInputValidation.Text = "Input not reconised "
'Code from http://amrelgarhytech.blogspot.com/2008/03/fraction-to-decimal.html ,,Fixed error to get to work. Return "Error Please Check Fraction"
Starting from the top we need the “Imports System.Text.RegularExpressions” for checking user input in the second test. Next we set inputNfo as a string and equal it to the input text. Then we run the inputNfo thru the VB.Net built in “IsNumeric” function to see if it is a recognized decimal number, if it is , then just return that number to the output textbox. No Conversion needs to be done. If inputNfo is not recognized as a number we then pass it to the regular expression test and make sure the user is not trying to spell out the number(three instead of 3), if they are, it returns an error, if not then it passes on to the next test. “22. 3/4” , with the decimal in place it will return an error. We could add more code to handle that problem and fix it but, why baby the user, make them input the information correctly so they don’t get used to inputting the information incorrectly. If it fails the test then it returns an error message, (as in the screen shot above) if it passes then it returns the result of the Conversion as a decimal. Again, do to the massive amount of calculations my final program will require, I need to validate every possible way a user could input a number so the end result would be a decimal, and then I would be able to do the calculations on the input parameters. If I catch all possible input errors then any output errors should be easier to trace and fix. The output of the 8 lengths in my final application will then be converted back from a decimal to a fraction rounded to the nearest 1/16th of an Inch. 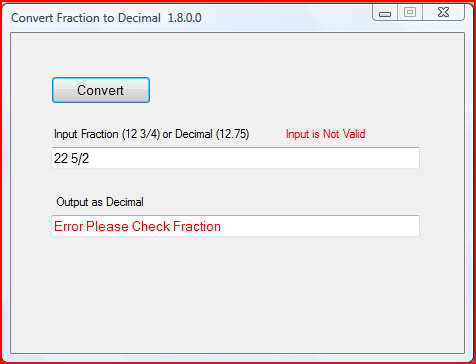 This entry was posted in CodeProject, VB.net and tagged Fraction To Decimal Conversion, input validation. Bookmark the permalink.